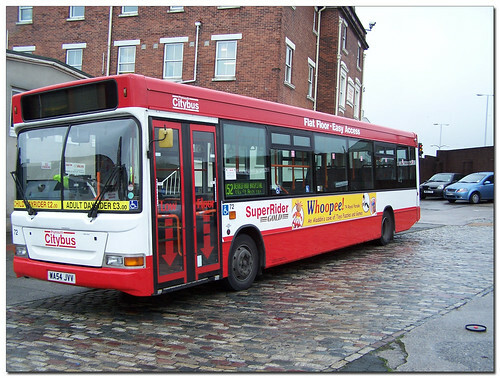 Thanks to Brian George I can bring this photo of Plymouth Citybus 72 in a new version of the current livery. Its actually a partial repaint, loosing the awful gray skirt. It has a neater rear end, and a more sensible front end. It seems that this batch of darts are all being tarted up this way. Its certainly a big improvement on the former livery. More interesting is that the fleet name has reverted to the previous style which always seemed too fiddly. This older classic version is much neater and suits this livery a lot better. Well done Citybus. Hopefully this partial repainting scheme will see more of the fleet receiving the new livery (either version) a lot quicker than otherwise.